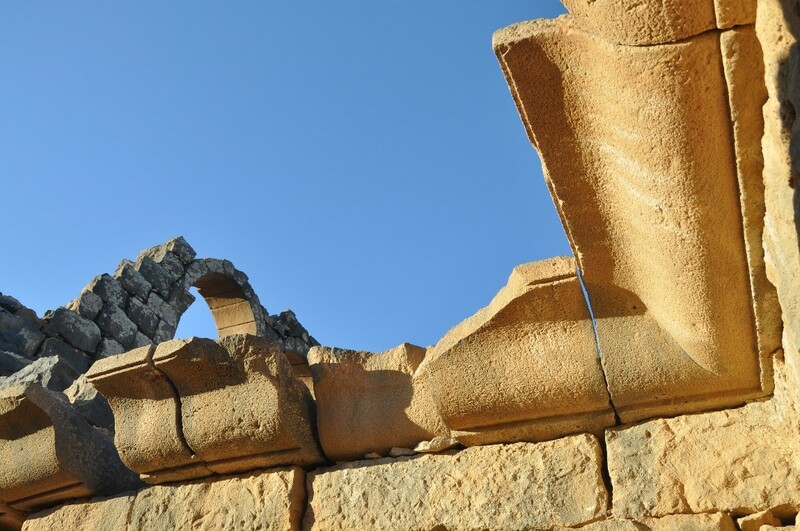 The preservation of a corner ceiling molding in a early Byzantine period house at Umm el-Jimal, Jordan, April 28, 2014. These experiences shaped my curiosity throughout my career as a historian and archaeologist studying and teaching ancient history, when vast numbers of local peoples lived and coped as conquered subjects of all-powerful distant empires. However, while I could remember and treasure my personal childhood experiences, the ‘voices’ of ancient subject populations were usually not preserved. Collective memory (historical sources) tends to be produced and controlled by the occupiers who either give no space in their memoirs to the occupied, or, on the rare occasions they do, speak of them with disdain – call them ‘barbarians,’ and the like. So, to answer my questions about resistance and dignity of the occupied of antiquity, I had to go to non-written sources, for the occupied did leave the traces of their lives in the material remains that survived in tells and ruins. And, when I first visited the ruins of Byzantine Umm el-Jimal in Jordan in 1972, I was not only impressed by the remarkable preservation of the site, but also because the 150 standing houses were clearly not the monumental palaces bragging of the wealth of the powerful; instead, they were the sturdy no-nonsense houses of local people on the edge of the Syrian desert. 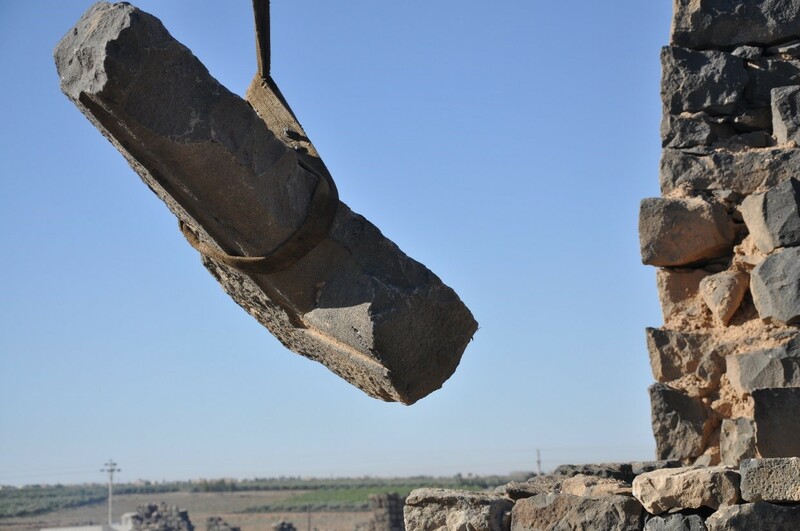 I therefore chose Umm el-Jimal as one of my career-long projects in part because it provided an opportunity to see how a local culture group fared under the influence of distant empires. Umm el-Jimal was founded as an outpost of the Nabataean kingdom (ca. AD 90), a phase that survives in clearly Nabataean fragments of the sort of monumental architecture you can see in Petra, Jordan. It is clear that the regional population, Arab nomads, were encouraged to settle into a more agrarian life, though whether by force or desire is not clear. When Rome under Trajan (AD 106) annexed the Nabataean kingdom, Umm el-Jimal became a Roman outpost, with new monumental structures, the surviving fragments of which reflect a temple, government offices and military occupation. The breakthrough in my quest was the discovery in 1981/84 of an adjacent village of very poor houses, which, in the framework of my quest, I have interpreted as the local workers’ village which supplied the manual labor for construction projects and basic services, the sorts of things subject populations do for ruling elites. In the fourth century the disaster that struck the eastern empire — the famous rebellion by Zenobia of Palmyra — brought ruin to both the Roman monumental site and the workers’ village, which was abandoned forever. However, in the fifth and sixth century – called the early Byzantine period –local people built the sturdy village of 150 houses and 16 churches spread through the new neighborhoods. I see this as a period when local people were able to assert themselves without the burdens of heavy taxation and virtual enslavement by the occupying empire. What these houses show in their sturdy, practical simplicity is a dignity that reflects satisfaction without the need for ostentatious display. At the same time the excellent quality and durability of construction is indicative of a sophistication that belies the notion that local people tend to be backward and barbaric. 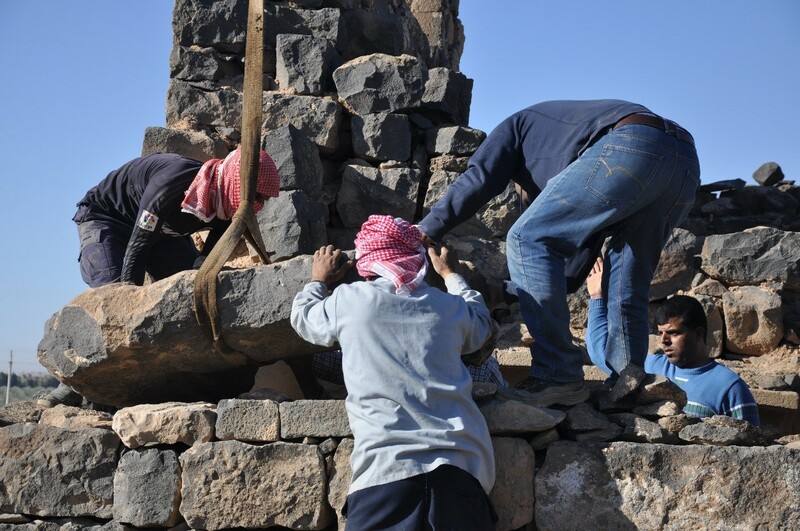 In fact, their work shows an imagination and tolerance that allowed these local builders to combine the best of Roman and Nabataean craftsmanship with their own traditional building and design skills. 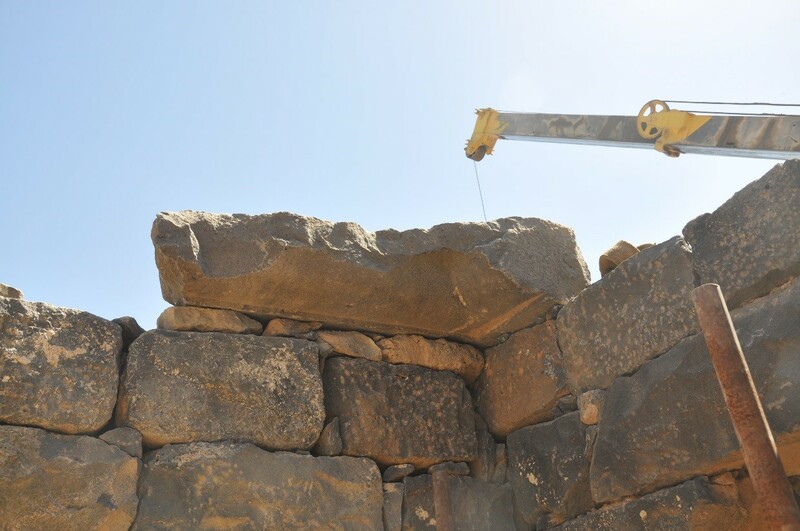 Below are a series of photographs showing the repositioning of a large building block, a part of the preservation of a ceiling molding in the room of one such sturdy house (House XVIII at Umm el-Jimal, which we’re restoring with a grant from the U. S. Ambassadors Fund for Cultural Preservation). Two things are striking about this particular process. When replacing these finely carved ceiling moldings, we discovered the name of a Nabataean mason, Abd, signed on the rough backside of one of these stones. 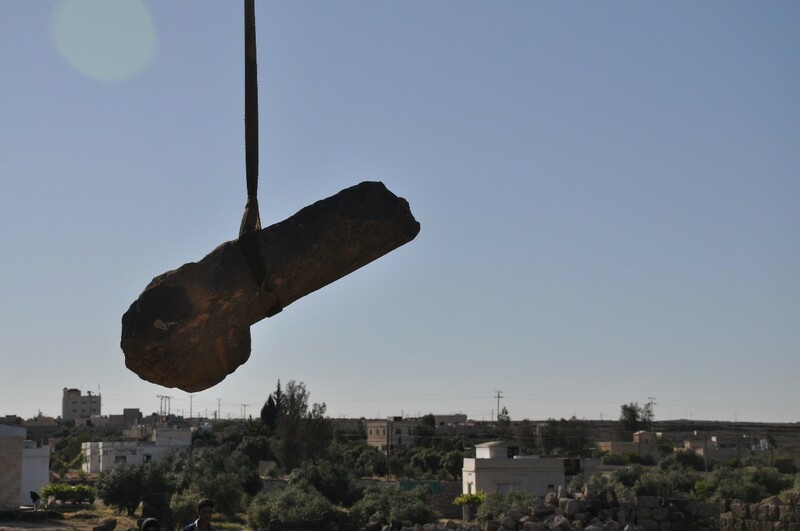 This means that the sturdy, practical Byzantine Arabs had reused these monumentally carved stones from the Nabataean ‘high’ culture in their new ‘local’ building. I see this as a symbol of the liberation of the local population after centuries of subjection. 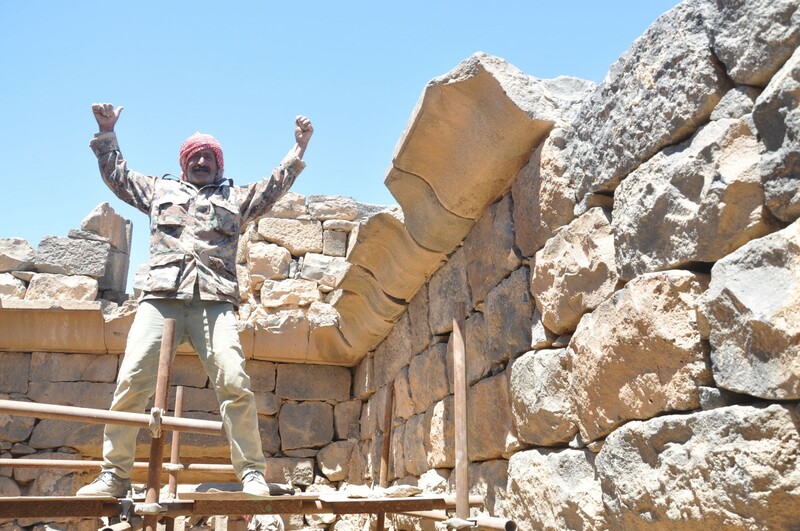 The second thing to see is the high skill of the modern local Umm el-Jimal masons, whose confidence and joy is displayed in the last picture with Awda, the chief mason, raising his hands in celebration of his own victory and liberation. May 28-June 27 2014 Conclusion of House XVII-XVIII Preservation Project. The site will serve as a field school for Calvin College Archaeology minors and graduate students. This entry was posted in Bert de Vries and tagged archaeology, architecture, dignity, empowerment, history, Jordan, Nabataean, occupation, Roman, Umm el-Jimal. Bookmark the permalink.